Today’s gospel reading begins with a simple but profound question, “What must we do?” For St Luke, the question is one of his principle leitmotifs in his two volume work as it appears frequently in both the gospel as well as in the Acts of the Apostles. In each instance, the question reflected the questioner’s desire for salvation. But the question also functions as a key which opens the way to further revelation of the good news and the challenges it offered to those who would hear it. “What must we do?” is a valid question for all of us during this season of Advent, as we seek to be continually renewed in the spirit and mind of the coming Christ. For the crowd, the toll collectors and the soldiers who heard John’s preaching, the message was a powerful one. The key that links the answers given to all three categories of persons is repentance. In New Testament Greek, the word for repentance is metanoia, which means literally a change of mind that determines how we live. The Baptist tells these private citizens, tax collectors, and soldiers that the glorious fruits of repentance include much that is ordinary. They are to cease from extortion, bullying, and grumbling about money. They are to share with the destitute their surplus clothing and food. Notice that John does not ask for anything explicitly religious such as fasting or temple sacrifices. He does not demand the extraordinary, great mysticism or asceticism such as his own relocation to the wilderness and daily diet of locust and wild honey. They were not asked to leave livelihood, home or family. That would be a higher calling that comes from Christ for those seeking perfection. What John tells these people thirsting for direction in their lives is that opportunities to bear fruit appear right in front of them every day. Always practical and ever the realist, he simply points out the first step they can take in a new direction. By their repentant behaviour--by what they abstain from doing and what they choose to do--they will leave themselves open to wherever God directs them next. What was required was a practical righting of personal wrongs in view of the particular temptations of their way of life. Why even speak of lofty things, when we can’t even get our daily act together? 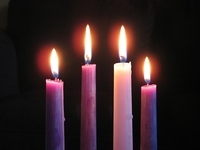 On this third Sunday of Advent, traditionally called gaudete (Joy) Sunday, the church asks us to consider some equally strange advice from scripture. The Entrance Antiphon is what St Paul tells the people of Philippi, “Rejoice in the Lord always.” Now that sounds like what this season of Yuletide is supposed to be about - good cheer and holiday exuberance and all that. But, when we get to the gospel for this week, the figure of John the Baptist and the effect he had on the populace clearly reflects the true meaning of Advent joy. Once again we are reminded that the God who is coming is not Santa Claus “who knows whether you are naughty or nice” but Jesus, God with us, the one who demands that we “turn around” and “follow” him. The clue to real joy is repentance. Instead of finding “joy” through a “positive” psychological assessment of ourselves, “I’m ok, so I don’t need to change anything,” or the mindless advice to “Be Happy” no matter what is happening, ignoring the fact that our economy and currency is down in the doldrums, we are told that “joy” is what happens when we respond to that which God demands of us; and what God demands, in the words of John the Baptist, is “repentance” or a change of heart. What the gospel is trying to do for you today is release you from the counterfeit “joy” of popping another happy pill or turning up the music. Real “joy” is what happens when we “confront” our sin, “face up” to what keeps us and others unhappy, and “turn toward” God's redeeming love. And turning toward God leads us to reorder our lives with others, into something which is life-giving rather than death-dealing. The Good News of Advent is that God is coming to us, not to destroy us but to refine us, to help us to become what we were meant to be. The One more powerful than that charismatic preacher, John the Baptist, is coming, the one who will baptise with Holy Spirit and fire. Indeed we are recipients of that life-changing and life-gifting baptism. It is God's great gift to us: to own up to what we have been and done, express our sorrow and be relieved of the terrible burden of having to think that we are “right” all of the time. So what must we do? Let’s start with the ordinary, with the daily programme, with the familiar, and work our way up!